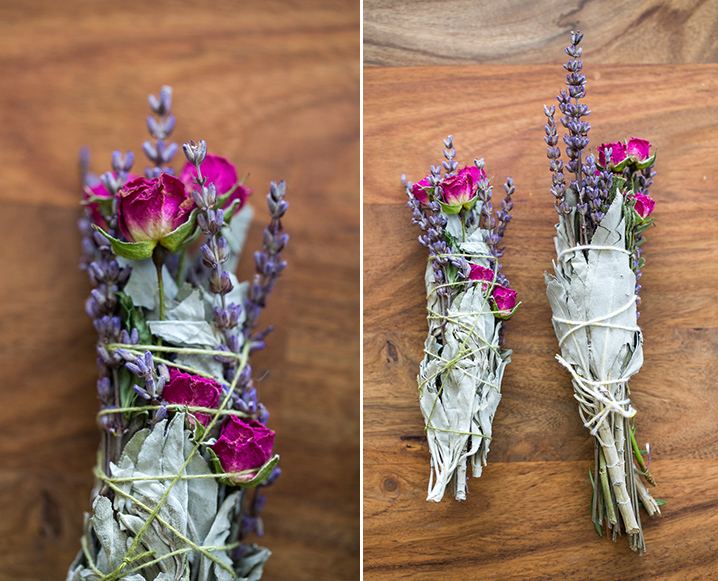 Continuing our obsession with dried flowers this summer, we came up with this simple project to infuse a bit of floral goodness into your home in an unexpected way. So you know about smudge sticks, yes? Those bundles of dried white sage that hippies like to burn? Well, what if you made your own using some extra fragrant herbs and flowers? Even if you don’t burn them (though you totally could), they’d make a beautiful hostess gift or favor for a bridal or baby shower this summer. They’re just so pretty as an object of appreciation in your home. A starting note: You can buy the herbs already dried if you like, though they will be more difficult to wrap up together since the leaves will be pretty brittle. You can also find your pieces fresh, wrap them how you like and hang them up to dry for a few weeks. Share the post "Sage, Cedar, Rose: How To Make A Smudge Stick This Gorgeous"
of him as nobody else recognise such certain about my trouble. Very nice indeed. But far from being ‘bundles of dried white sage that hippies like to burn’, smudge sticks are a very sacred tool for First Nations ceremonies. They are our medicine. We burn them in ceremonies or to cleanse new spaces, or spaces where bad things have happened. Our four traditional medicines are sage, sweet grass, cedar and tobacco. In order for them to be authentic, one has to harvest the medicine themselves. This is very important, as whatever you burn echoes the feelings you put into it. It is the same with art, and the same with food preparation. You have to put positive thoughts and think about the outcome you want for this place, or your smudging will not be authentic. Not a hippy thing. An indigenous thing. Your flowers are cute, but you don’t mask the ignorance here. What you’re doing is colonial and frowned upon in many circles, and it seems clear that you did not know that. Despite this, if you do read your comments atleast, I would reconsider leaving this post up . I would rethink encouraging this sort of action if I were you, in respect to the struggle we indigenous people face daily when it comes to truth and reconciliation, and reclaiming our territories and traditions. I have griwn white sage and roses and lavender and I wanted to give this gift to my family and friends. Do you think that’s OK? People, give the finger shaking, and cultural bashing and shaming a rest! Homo sapiens have been bundling flowers and herbs for millennial. This gathering, binding, and burning of plants is not an “indigenous” trademark or copyright. It is not “colonial” or cultural appropriation. Modern and Ancient tribes and cultures of Europe, India, Asia, Africa, indeed people in the northern and Southern Hemispheres use and have used the bundling and burning of plants as an innately human artistic, spiritual, and healing expression. Do you “shamers” deliberately search websites to post your self-righteous, educationally judgmental and indignant comments on what you perceive as injustices to your culture? Talk about ignorance and time wasting. Perhaps, you should appreciate and comment on the beauty of using plants in any fashion. I so agree…stop the bashing. I think the smudge stick, as is labeled here, is most lovely. Mamaj is quite right in her analysis of bundling plants. If you research, you will find the Ayurveda and other ancient lifestyles used these. I would much rather do this than have a pot of artificially scented wood chips siting around gathering dust and creating migraine attacks for my daughter. I will be looking around this web site for more helpful and beautiful hacks on life. Thanks for posting this. Smudging is not something to be taken as lightly as its presented here. The cultures that smudge have had rituals for millennia, but this write up ignores the sacred and links the practice to hippies. It’s frustrating to see that this website hasn’t taken this article down in over a year. Smudging is not just a “trend” that you can use in “your own way”. This is cultural appropriation, and those who continue to ignore these comments are perpetuating colonization and are being oppressive to indigenous peoples. Please try to be anti-oppressive and more inclusive in the space you have created here – especially if you’re goal is to spread love. I love this, thank you so much. Do you not realize how ridiculous you sound? I guess we shouldn’t burn candles for the wonderful smells or decoration either because some cultures and religions light candles in remembrance of dead loved ones or as a symbol of prayer for the sick. Wow. Just wow. I get what you’re saying. We are ALL indigenous at our roots. So really it is an indigenous thing just not limited to one culture but something that can be found in all cultures. The medicine of the lands will perhaps speak to us in different ways. We are all related. So I guess according to “indigenous” individuals, I shouldn’t be smudging. Well, considering I’m Pagan, and its part of MY religion, who is anybody to tell me that I shouldn’t be doing something. Burning things that smell good doesn’t belong to any people, it belongs to ALL people. Some do it because it smells good, and others do it because its part of a religious or ritual ceremony. How bout you do your thing, I’ll do mine. Oh, and don’t bother to tell me that how I’m doing it is wrong, because “your people” supposedly did it first. Get over yourselves. I think that there’s some real defensiveness going on here in the comments. So much of our White American heritage IS colonist. Speaking of getting over it, we need to and start recognizing when we are doing so and make corrections. As for these items……when you call them smudge sticks, that’s where it keys in. Call them something else…..which these actually are when the instructions say to include whatever dried plant material you have around the house with no attention paid to thinking about whether the materials should be burned (or whether the smoke would be OK to breathe). As for Pagan? Yes, I’m Pagan too. And using burning herbs for cleansing is part of what many of us do. Distinction, for me is awareness of colonization process and whether one it taking the practices of 1st Peoples……or burning herbs like our ancestors did as well. Lastly, telling someone to “get over” the on-going experiences of colonization is such a typical colonist remark. I’m sorry to read a co-coreligionist say so…..not part of my Paganism. This is why I am a Hedgewitch. Such judgmental comments and backbiting going on when really we are all connected on this Earth. We all need the same things to survive and all believe that we give thanks for what we receive from the Great spirit or God , whatever you want to call your diety. Yet we cannot get on together and just accept our differences. It is trite to say burning smudge sticks is a hippie thing. It is incorrect to say only one people have the right to do so, the Ancestors of many races did this. Australian Aborigines still do smoking rituals at every important gathering. Stop being so racist and accept that we are all human. We all share the Earth and what we do affects the entire human race, not just parts of it. Now I will go back to my solitary place and continue to try and be a positive force in the world. I trust you will all do the same. What would be the smugging formula for getting rid of kitty litter or dog smell. Thinking kind of a natural antibacterial for the air. Love you smudge sticks, love to see more! This sort of bashing seems to be prevalent on so many smudge sites….yikes! When people are making and using something beautiful (botanicals available all over Earth, not just in “indigenous” locations), how is that a rip-off or a negative, as some are seeming to imply? Beautiful things were meant to be shared/used…not singularly owned by any group. Intentions work both ways. Like the earth, sage is God’s creation for ALL of his children. Thank you for sharing your beautiful sage creations. I use them to cleanse and clear spaces. You are now more aware of the sacredness of white sage. I was taught smudging by a native teacher. I have seen it used extensively by the native healers I have had the privilege of working side by side with. I have been able to grow my own white sage this year and will be harvesting it in a few days. Your dried bundles come from your heart and are beautiful. These will make some nice gifts for grandchildren to introduce them to the gifts that our plants bring us. I love your herbal wraps and plan on making them with my grown daughters. We do use the sage to clear our homes (and other things) but never thought to add the other herbs or flowers. Lavender, Rosemary, Rose and others can also be used for healing, remembrance, or other specified reasons for adding them to the bundles. Each one will have meaning and use to the person making it, and this is reason enough to do it. Beautiful. Although I do not have these herbs or flowers in my yard, where could I purchase them? I would love to make these for my daughter. You don’t have to be “this” or “that” to do “this” or “that”. Do what makes you happy! I love this I usually just use white sage but this sounds Loverly I’m just decluteringmy home and will try this thank you for sharing . I also have a patio out side and would like to hang acouple out side . I’m curious as the significance of the flowers chosen here. I understand the benefits of burning sage, but what are the benifits of burning the other flowers along with the sage? I am white. My teacher is First Nations. Don’t let the haters get you down. You are making beautiful smudge sticks with a positive intention. No harm done.